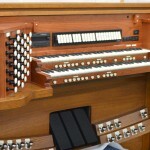 The old and beaten console of the St. Joseph’s organ before the project began. The organ’s console isn’t the organ, as I have pointed out before. But it’s certainly a major part of the organ. This week, after six months of careful renovation at our shop and at the shop of one of our specialty suppliers, the organ console for the St. Joseph organ returned to its place in the rear gallery of the church. A crew from the church joined with our Reynolds Associates team to lift the console back into place. At the same time, we also delivered some of the large pipes for two of the Pedal stops, the new set of chimes, and the four new reservoirs that will supply steady regulated wind to the new windchests. 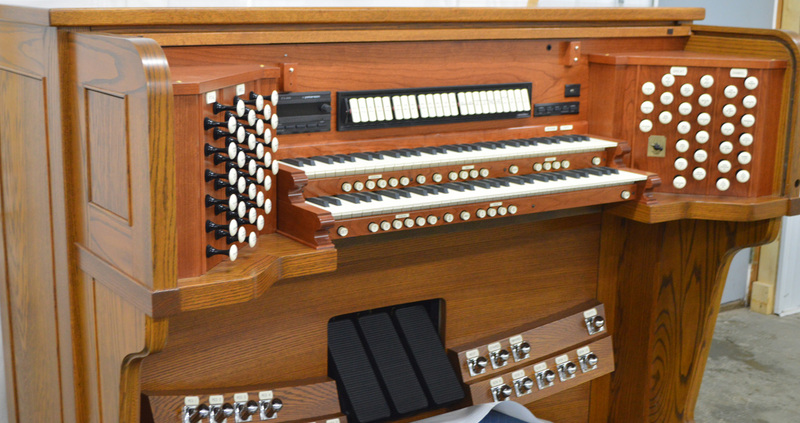 After renovation, sporting all new controls mounted in a cherry-wood interior, the console is ready to be part of this “new” pipe organ!